Culinary words of wisdom spoken from my cousin, Silvia, in Modena, Italy, about my family’s 35-year old aged “ aceto di balsamico” (balsamic vinegar), as she lovingly gave me a precious bottle to bring home to the States. The sweetness and syrupy-thickness of my family’s balsamic vinegar cannot be priced, because it’s beautiful deliciousness is completely PRICELESS in the love and passion put into its production! Added to the fact that I have a family in Modena, Italy, who produce their own private barrels of balsamico in the only Italian city where the production of Balsamic Vinegar qualifies for earning the authentic stamp of approval from the entire country of Italy! On top of that, it is truly a BLESSING to have such kind and generous relatives in Italy!
. . . well, that makes this brown sweet-sour vinegar simply SPECIAL! And grilled peaches . . . who would have known how yummy they are? The grilling just amps up the sweetness of the ripe peaches! Heavenly! I’m not going to ramble on about this recipe . . . it is perfection and was given to me by my cousins in Italy, where they know how to prepare food in its splendid simplicity. The Italian Mascarpone was sweetened by locally-produced wildflower honey. A simply exquisite combination! 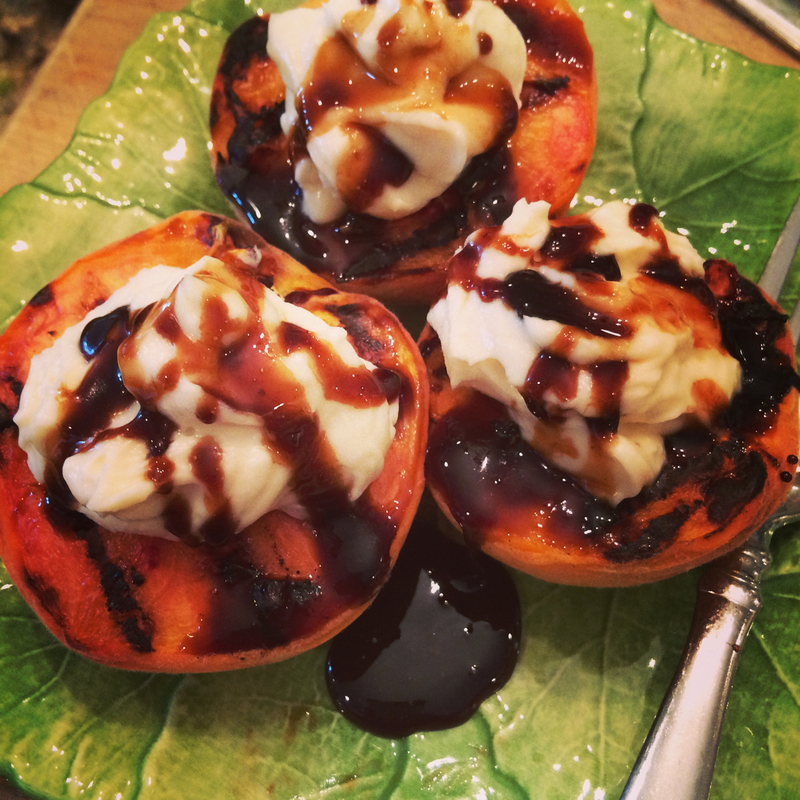 The fresh honey added to my family’s thick and aged sweet Balsamic vinegar took a simple peach to dessert nirvana! Even Mr. Meat and Potatoes who is skeptical of unusual food recipes RAVED about the entire combination of this dessert! And that is saying a lot for a guy who only asks for strawberry ice cream! If that isn’t a sign of the utmost approval, well then, I don’t know what is! Want to know how to make your American friends enjoy this even more? Serve these on top of vanilla ice cream! Oh yum! I hope that you enjoy this delicious recipe! Get ready for a taste sensation on your taste buds! In a small pan, heat the balsamic vinegar with honey (add to your taste preference). After about 10 minutes when the honey-balsamic mixture is thick and syrupy, remove from heat. Blend the Mascarpone cheese with the honey. Grill peaches with the cut side placed down on the grill, about 5 – 8 minutes until dark char marks appear. Place the grilled peaches on pretty serving dishes and top with the honey-sweetened Mascarpone cheese. 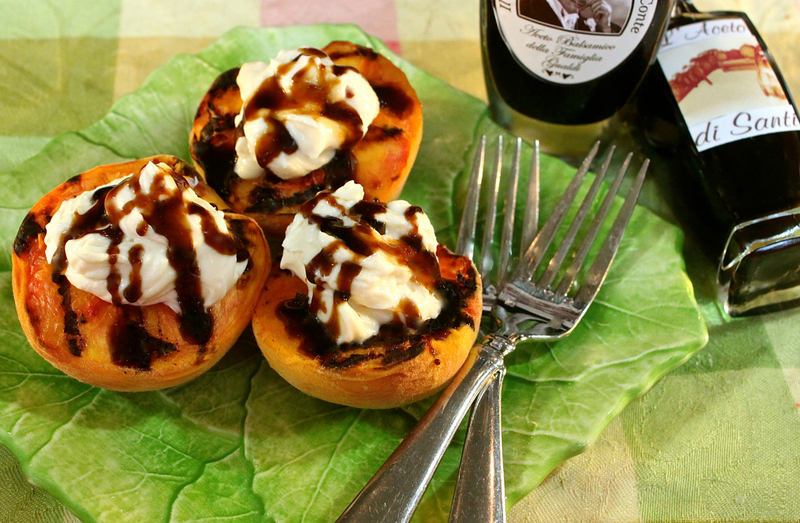 Drizzle the Balsamic syrup over the peaches and Mascarpone cheese. Always use freshly picked, ripe off the tree peaches. The best come from the peach farm stands or road-side stands and farmers’ markets. Those in the grocery stores are usually picked before they are ripe and they lack the flavor of the freshly picked, ripe peaches. Free-stone peaches are easier to remove the pits and my family personally prefers their flavor and texture better. Don’t over grill the peaches. Both gas and charcoal grills work equally well. 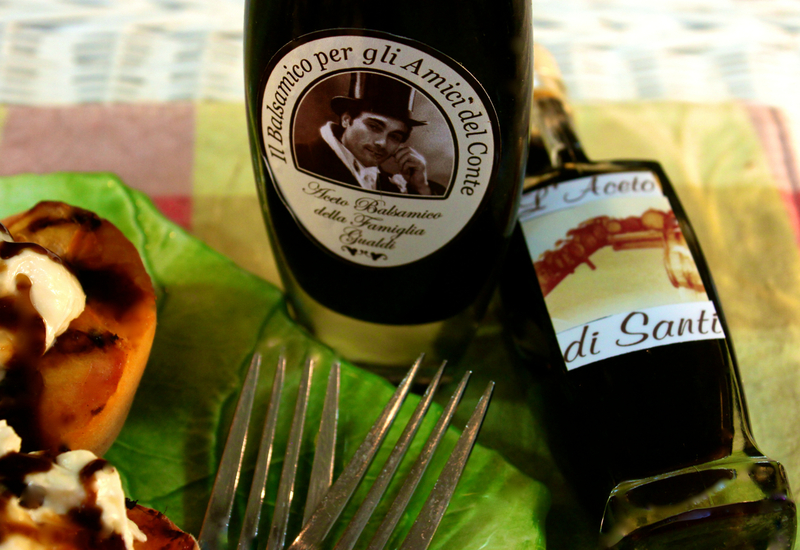 It is imperative to purchase the highest quality of Italian Balsamic Vinegar produced only from Modena, Italy where the product is protected by the Italian government. 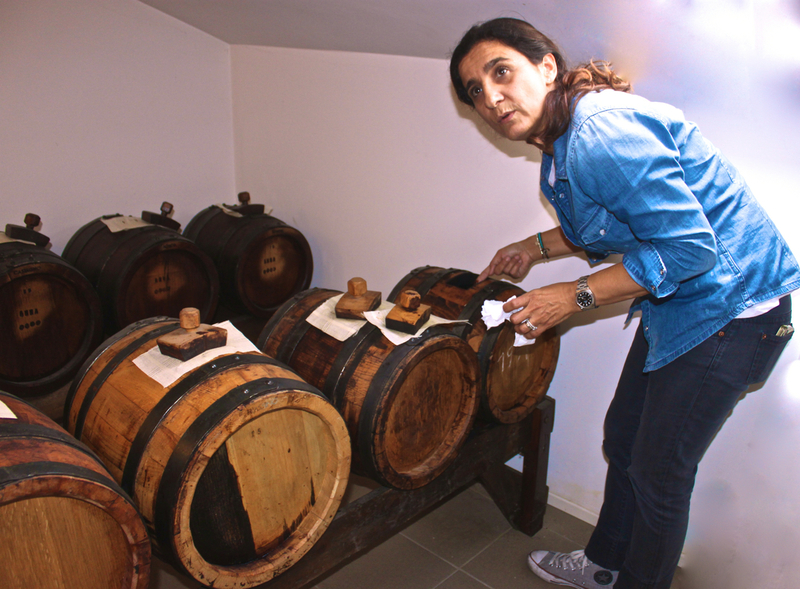 No other place in Italy is allowed to produce balsamic vinegar outside of Modena. When purchasing balsamic vinegar from Italy, beware of the lower quality varieties with high prices. There are only a few good brands. 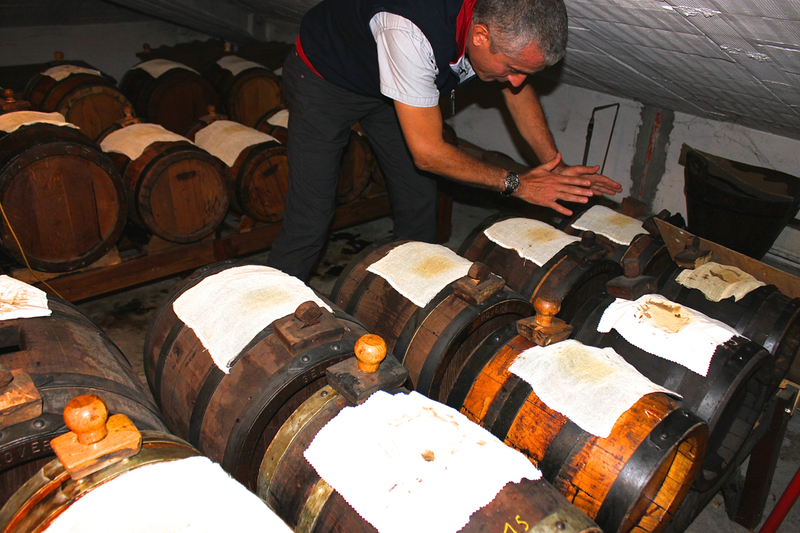 Every Modenese home has their own balsamic vinegar barrels in their ‘cellar’ with starters that are centuries old passed down through generations of family. Try to use organic and local honey and support your local beekeepers. ENJOY WITH A CHILLED GLASS OF VENETIAN PROSECCO!!! the Balsamic syrup is so thick! Yours is such a lovely blog! I stopped by through Sunday Supper and I’m glad I did–I love the vibrancy of your writing, and your recipes have such an authentic finesse to them. Especially this recipe! Such a lovely combo: it’s awesome to meet you! How kind you are Ala, and I’m so pleased to meet you too. I’ll be right over to visit your blog to discover some deliciousness! 35-year old aceto di balsamico! wow.. Roz, lucky you! These grilled peaches must have tasted heavenly! Relatives in Italy–you lucky gal. These peaches are making my mouth water. Love that syrup. Pinned. Thanks Jennie! I appreciate your visit and comment and will stop by to see what you’ve been cooking! The balsamic sounds like a great gift and I’ll bet you’d like to bring home a barrel. I don’t eat a lot of peaches, but grilled is one way I like them and topped as you did them, they had to be fantastic. I would have LOVED to bring home one of those aged-barrels of balsamic vinegar….can’t even imagine the worth of one of the oldest dating back to the 60’s! I also wish that I could make it myself! I’m dying here. When are you coming to my house with some to share? It sounds absolutely to die for. I got the most amazing balsamic vinegar when we were in Italy in a tiny store in a small village in Tuscany. I am completely jelly that you have access to this!! Your peaches look amazing!! Thanks Tara for your visit and kind comment! I’ll be right by to see what you’ve been cooking! 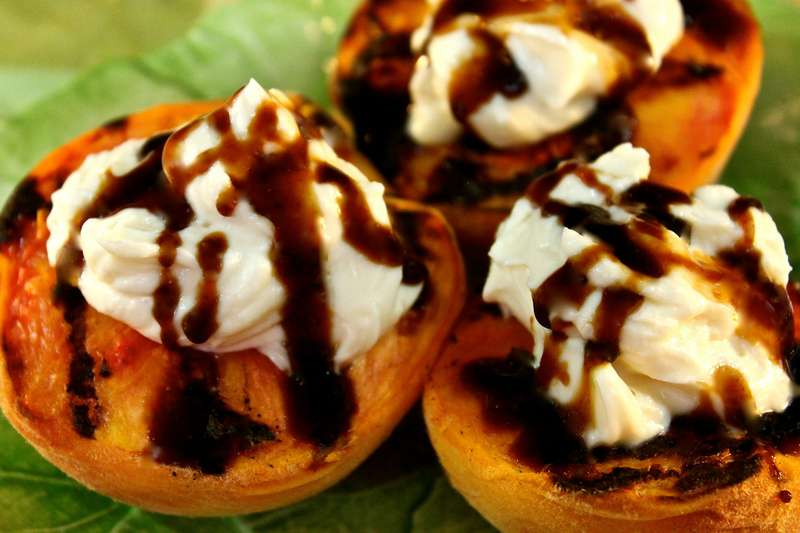 Nothing beats grill peaches – and topped with high quality, aged balsamic, you cannot go wrong! Did not have any great aged balsamic vinegar. I went to Philadelphia, for my husband’s eye surgery at Wills. I went shopping and found a place that sells 25 varieties of olive oil and 25 varieties of balsamic vinegar. No store like this in New Jersey. I bought age balsamic vinegar and dark chocolate vinegar. substituted the chocolate vinegar for the aged. It was amazing. YOu went to the Tubby Olive store in Phila. They do have many flavored vinegars and oils that I like, however, as my son points out to me, these do not compare to the aged Balsamics from Modena. It is like a fine aged wine- very precious. He brought a bottle back from Italy for me and we use it sparingly. It is heavenly over grilled peaches! Peaches in any form are a-ok with me! Peaches are such a summer gift! Thanks for stopping by! How special do be able to use your family’s balsamic for your recipe! 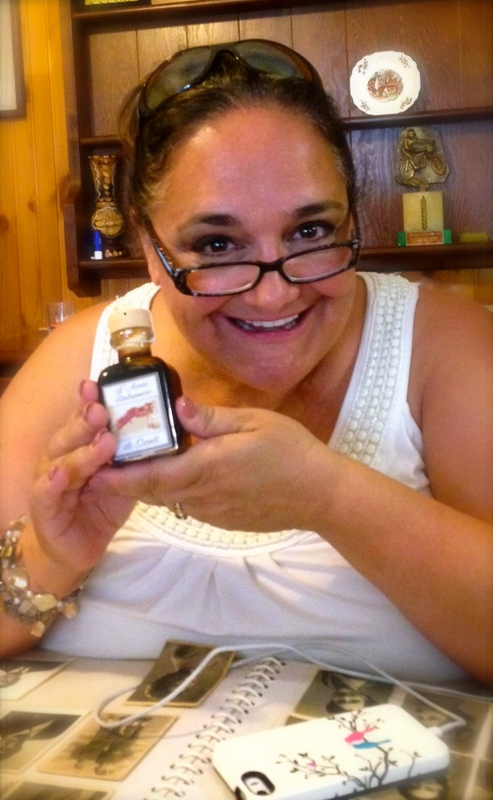 Thanks for your visit to my blog and kind comment about my family’s balsamic vinegar, Melanie! Hope you’re having a great day full of delicious eats! My hubby would love this. He loves balsamic vinegar. I’m not a fan of vinegar but maybe it’s just that I haven’t had good balsamic vinegar. You’re very lucky to be able to spend time with your cousins in Italy. I have a couple of first cousins I’ve never met and one that I’ve met once. Hi Annamaria, I couldn’t imagine life in the kitchen without delicious balsamic vinegar and what it does to enhance recipes! I do count my blessings to have cousins in Italy who have carried on the tradition of making artisanal aceto balsamico! Hi Liz! Yes, you’re right, it is so hard to use up really good, really expensive, really family-home-made balsamic vinegar! I wish I could have some on a monthly basis! Mom is in the Netherlands right now and then to Modena, Italy to see the family . . . she’s on her ‘bucket list’ and hopefully we can all be so spry at 87! This is so mouthwatering! I’m going to make it this week! Wish I had one right now! Yummy! Thanks so much for your visit to my blog back in July. Sorry to respond so late, but my job has taken over my life (sadly). I’ll be right over to see what you’ve been up to in your kitchen! Wow! Just made my first batch of grilled peaches last! I can totally see how your recipes would make grilled peaches so sublime! And wow again about your family’s aged balsamic. I’m sure it’s to die for as the saying goes! Thanks Martin for ALL of your kind compliments! Aren’t grilled peaches (and any fruit or veggie) just great? I’m so glad that I’ve recently discovered this technique too! Hope you’re doing well! I enjoyed seeing photos of your trip and your family in Italy, Roz. The balsamic vinegar sounds just heavenly! Pairing it with grilled peaches seems perfect since it is such a simple dish, the vinegar would really shine. I’ve never tried grilling peaches before, but they are my favorite fruit so will have do that. And mascarpone cheese with anything is great with me! Thanks for helping me think about grilling in a whole new way! I’ve really gotten into grilling and roasting more fruits and veggies, Shari, because of how the flavors intensify. It’s so much fun experimenting with new things! Heavenly! This is a fabulous summer dessert. Grazie mille bella amica Rosa! I love everything about this dish … so much so that it’s going on my to-make list ASAP! Hi Kimberly, If you did make the grilled peaches with mascarpone cream and sweet balsamic syrup, I hope that it was delicious! Thank you so much for visiting my blog and for leaving your sweet comment. I’ll be right by to see what you’ve been cooking up in your kitchen! I love your comment Christy and I apologize for responding so late; life at work has over-consumed me and I’ve not commented to your (one of my favorite) blogs. I’ll be right by shortly! You are very lucky indeed! There is no comparison to ‘real’ aged balsamic vinegar! I have peaches in my kitchen that are just screaming to be transformed into this dessert!!! I absolutely love Mascarpone cheese and the simple yet delicious way you have done these grilled peaches sounds so incredible. WOW what a treat! And made by your own family? That is priceless. I am sure that you treasure every drop. That sounds absolutely delicious. Yes, it’s pretty special balsamic vinegar from my family Dionne! I wish I knew how to make it myself too! well I’ve never heard of sweet balsamic! I want to try it now! : ) thanks for sharing – and how luck you are!! This recipe sounds amazing! 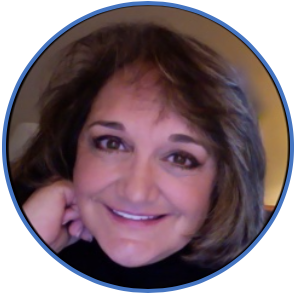 I’m new to your blog but I enjoy learning about your family and experiences! Oh thank you so much Claudia! I appreciate your visit and your kind comment!